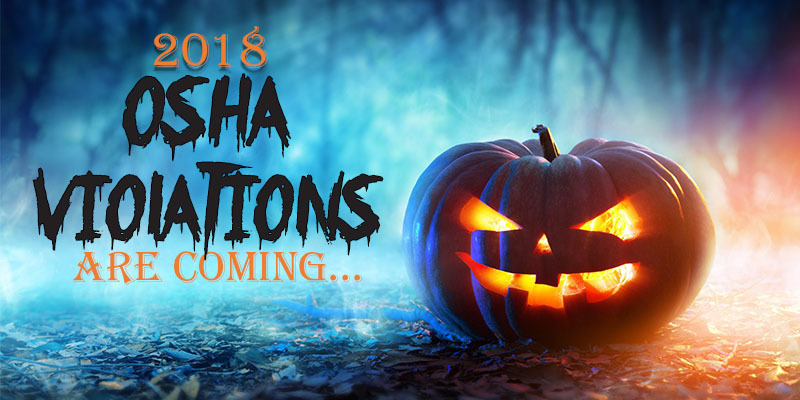 It’s October and while most people’s thoughts have turned to cooler temperatures, autumn leaves and pumpkin spice, those of us preoccupied with occupational safety secretly recognize this month as the time of more anticipated topics, such as of the release of OSHA’s Top 10 Violations for 2018. Based upon accumulated statistics from October 1st through September 30th, 2018, OSHA’s Top 10 Violations is an annual, well-publicized peek behind the wizard’s proverbial curtain. The list unveils the past year’s most frequently cited standards stemming from OSHA worksite inspections and is released, in part, to help educate employers regarding future EHS efforts. If you want to gain an understanding of what safety managers most often miss and the violations OSHA inspectors repeatedly identify in workplaces across the country, this list deserves your attention. These ten standards and Electrical—General Requirements (29 CFR 1910.303) have remained on OSHA’s list for more than a decade, and this pattern sadly reflects the failure of employers to address these routine safety issues. Time for safety professionals to take these violations seriously. What safety issues deserve the most attention in your facility? Before you begin to plan and budget, consider the standards listed here. Fall protection, respiratory protection, lockout/tagout and electrical safety may already be annual cornerstones of your safety program, but be honest, when was the last time you updated these policies or reviewed your workplace’s procedures put in place years ago? Can you look yourself in the mirror and say with a straight face that you recently inspected scaffolding, ladders or machine guards and updated SDS sheets or any other part of your facility’s HazCom program? As the safety community awaits the release of this year’s Top 10 OSHA Violations, remember that EHS programs must constantly evolve and that procedures should be treated as living documents. With that in mind, it’s always a good idea to have another pair of trained eyes examine what you look at every day. Audits, employee training, targeted assessments, etc. provided by outside consultants are effective tools for supplementing your best efforts; new perspectives offer invaluable insights and advice designed to improve areas of safety you might not realize are vulnerable. Never forget that one reason these Top 10 OSHA Violations persist year-to-year is that the majority of facilities in America believe that their policies are sufficient and their safety programs are up-to-date. Before joining that club of companies that discover they are mistaken (via inspection or injury), consider contacting The EI Group and allowing our EHS experts to assist you. Our safety professionals offer decades of experience addressing all OSHA standards and look forward to fortifying your program, no matter what 2018’s most popular violations turn out to be. If you have questions about any of OSHA’s Top 10 Violations and what we can do to address specific concerns at your facility, please contact me at (919) 459-5252 or jpoole@ei1.com.